Attendees will also actively engage with the speakers as they participate in unique BOF “BIRDS OF A FEATHER” interactive group discussions. Each group will be presented with a real-life situation that relates to brand marketing utilizing music & live entertainment to collectively discuss challenges and find solutions. In Fall 2017 K-Swiss introduced the “Generation-K” campaign geared towards individuals we like to call Generation K(swiss). This new collection was made to inspire and outfit the next generation of entrepreneurs. Today’s youth are not trying to be athletes or chasing empty fame. They want more. They are building their own brands, companies and businesses. 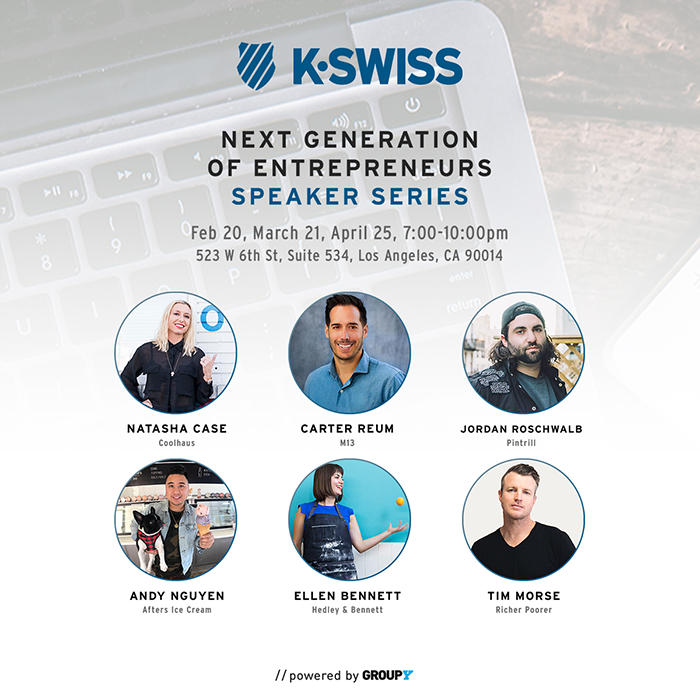 Driven by creativity and the digital economy, this is the next generation of young entrepreneurs, where smarts, hustle, and success define your status. Since 2006, Group Y is the original and leading collective of professionals focused on Youth Marketing, Lifestyle and other progressive and expressive cultures. Our mission is to intersect influencers across industries and ignite ideas that inspire the current and next generation leaders and decision makers. Leveraging events, outreach, content and consultation, Group Y takes the work out of networking and strengthens the areas where industries overlap. From the beginning, K-Swiss has been driven by an entrepreneurial spirit when two Swiss brothers moved to California to create a footwear brand focused on tennis. As avid skiers, the brothers took inspiration from leather ski boots to create a tennis shoe that supported aggressive side-to-side movement. Introduced in 1966, the K-Swiss Classic was the world’s first all-leather tennis shoe and powered some of the best tennis players of the time to win major championships. It quickly gained worldwide acclaim and became a style statement both on and off the court, worn casually in country clubs and just as fashionably on city streets. More than 50 years later, K-Swiss is building from its heritage as an American tennis brand and writing new chapters in its storied history. Paying homage to the hard work of our founders and the competitive nature of the game that inspired it all, K-Swiss is dedicated to outfitting and inspiring the next generation of entrepreneurs.